As we all know, there are many rules in which we have to follow when we play Runescape. But do we really know what each rule means, and what is considered to be under that rule? Here I shall provide a detailed explanation of why we have these rules and the situations that should be classified under that rule. Note: This guide has been approved by Mod Marvin for inclusion on a fansite. What is offensive language? It is a form of language which others find insulting or obscene. The reason that there is this rule is to maintain a friendly community within Runescape. It is important to have such a rule, as it protects the players from insults from others, especially when the insult is inappropriate for a particular age of players. So if you see anyone doing that, report them under the above rule. Q: Someone called me a noob! Is that offensive language? A: Nope, as what the rules stated, "noob" is not an offensive word. If you are annoyed because the player called you a noob, it's best to add the player to ignore rather than confronting him. Q: There are two players who are swearing at each other! What should I do? A: In a case where both players are being extremely vulgar, you should report them both under rule 1. But if you know who was the starter of the flame war, you should only report the starter. Then add both of them to ignore and move on. It is best not to say "Reported" as it can worsen the situation and cause the players to flame at you instead. There could be another scenario, where the two players are friends. They might just be joking among themselves with vulgar language. In such a case, you do not have to worry, as long as they are not affecting players around them. But if you find that their remarks are leading to a flame war, you should report them under rule 1. Before reporting, it is best to advise the two players to talk to each other in private chat, and only report when they refuse to. Q: A player is swearing but it is censored, should I count it as offensive? A: Since it's censored, the filter has done its job and the language is no longer offensive - which means no report. Just move on and ignore the player. Only report when the player bypasses the censor to swear. Q: A player said "****, I died again!! Wat the hell! Stupid ****ing randoms!! ", what should I do? A: In such a case, it is not offensive as the player is just letting out his frustrations. Even though the language may not be appropriate, but as long as he isn't directing it at anyone, you should just let him be. If you don't want to hear it from him, add him to ignore instead. What is item scamming? It is to deceive another player and cause them to lose their valuables as a result. This rule is extremely important, and protects players from losing their hard earned valuables. If anyone is doing the above, it is best to report them for the above rule. Q: A player just said "Follow to win 1mill!!! ", what should I do? A: These instances usually turn out to be trust tests or games, so it is most likely an item scam. You may follow the player, and if the player plays the "trust game", you should report the player under rule 2. Q: A player claimed to hold a drop party, but he didn't drop anything! Is that an item scam? A: Nope, since he didn't cause any players to lose any items, it is not an item scam. Q: A player is seen selling a weird item for 50k, and another player is buying it for 1000k. What should I do? A: This is probably a team scam. You should report both players to Jagex for item scamming. Q: A player is seen selling a weird item for 50k, is there anything I should do? A: A player can ask any price they like so long as they don't lie about it. Remember, you can check the Forums or a fan site to make sure you don't pay too much for an item. What is password scamming? It is a scam whereby players are tricked or persuaded into giving away their passwords of their accounts. This rule is crucial for making sure that each and every account is secure. If you find anyone doing the above, report them for the above rule. Q: A player keeps saying the word "pass", is it considered password scamming? A: Nope, it is not. There is no evidence that the player is asking for anyone's password, so it is not considered password scamming. Q: A group of players are discussing about passwords, what should I do? A: They are not breaking rule 3 by discussing passwords, as they are not trying to steal anyone's password. Q: There is a player, who is saying, "Buying free membership", what should I do? A: Even though it is not considered password scamming, it *is* against the rules of conduct. Report that player under "Encouraging others to break rules" instead. You appear to be telling someone your password - please don't! If you are not, please change your password to something more obscure! A: In an attempt to prevent people from giving their passwords away, RuneScape now prevents you from saying any sentence which contains your password. This is a security precaution, but it doesn't mean that you should solely rely on this to protect your password in the in-game chat. If you get this message often, consider changing your password to something that you don't say often (or at all). What is bug abuse? It is when a player uses an error in game to gain unfair advantage. This rule ensures that the game is fair for all players, so if you find any bugs in game, please send a bug report to Jagex by clicking on "report a bug/fault" on main page. Please do not tell anyone about the bug and not use it again until Jagex has fixed it. As it is hard to gather evidence of bug abuse in game, the only time you can know is when a player *admits* to bug abuse. If you see anyone admitting to bug abuse, send a report to Jagex, informing them of the details. Q: A player is harassing me in game, is that bug abuse? A: No, it is not. If anyone is harassing you in game, add them to ignore. If the player is using extremely vulgar and offensive language, report them under rule 1. Q: A player is telling everyone about a bug and asking them to try it! What should I do? A: In such a case, it is best to report him under "encouraging others to break rules", since the player is encouraging others to do something against the rules. Q: A player is discussing a bug, is that bug abuse? A: Nope, discussing a bug is not against the rules, as long as the player is not using it or encouraging others to use it. What is Jagex Staff Impersonation? It is when a player impersonates a Jagex Staff when they are not. All Jagex Staff have a gold crown when they talk in game, so you should know if the player is a staff member or not. This rule is important as it prevents them from being tricked by players who attempts to scam them by impersonating a staff. If anyone is doing the above, you should report them under rule 5. Q: A player says that his main is a player moderator, is that staff impersonation? A: Yes, even if his main is a player moderator, it is impersonation when he says that his main is a moderator on his other accounts. Q: A player private messages me saying that he works for Jagex and offers to make me a moderator, do you think I should believe him? A: Nope, remember that Jagex Staff will only invite you to be a moderator through *online message centre*. Also, Jagex Staff has a gold crown when they speak in game (even in Private Messages), so if the player does not have the crown, report him under rule 5. What is account sharing or trading? It is when a player shares an account with another player, or when a player sells an account in game. This rule is there to protect each and every account and to make sure that no player is encouraging other players to trade or share accounts. If you see anyone admitting to sharing/trading accounts in game, report them under this rule. Anyone who offers to give away their accounts for free or sells their account should also be reported under this rule. Q: Is sharing an account with a close friend or family member allowed? A: No, account sharing with anyone is not allowed, even if it was with someone you trust. Q: A player is saying "Selling membership account for 300k", is that considered pass scamming? A: No, since the player mentioned "account", most likely the player is selling the account, not the membership. Report the player under rule 6 instead. Q: I see a player selling an account on another site, what should I do? A: You should report the site to Jagex through a query. In your query, include the link to that site so that Jagex can investigate the issue. What is macroing? Macroing is the use of third party software that gives players an unfair advantage over other honest players. It is important that this rule is present as it discourages players from using third party software, which often contain keyloggers that steal their account passwords. If you see anyone using the above programs, report them under this rule. Q: There are just so many macroers! Does Jagex even care about them? A: Yes, Jagex does deal with them. Jagex has conducted mass banning of macroers before, if you have read the news archive. Just because they are not posting such news again does not mean they are not banning them anymore. It is just that they need time to look at the evidence properly before going on to take action against them. What is multiple log in? It is when a player logs onto multiple accounts at the same time, and these characters interact with each other. This rule is there to ensure that the game is fair and that newly created accounts would not have an advantage over other players of the same combat level just because these new accounts have a main with more powerful weapons. If you see anyone doing the above, report them under the above rule. Q: I saw a group of macroers with similar names; I think they belong to the same player. What do I do? 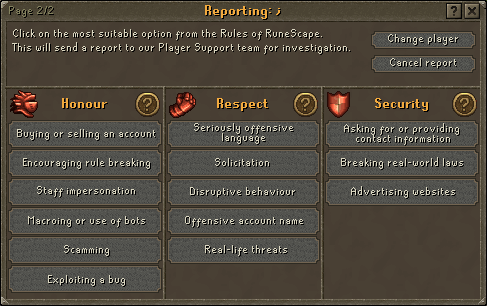 A: The best thing to do is to report them all for macroing and send Jagex a query explaining the situation and whom you believe is the player in charge. Q: A player is promoting third party software and giving a link to it! What should I do? A: In this case, report the player under rule 11. If you can, find a player moderator who would be able to deal with the situation better. You can also report the player under rule 9, as he is encouraging others to break the rules. What is encouraging others to break rules? It is to persuade another player into doing something against any of the 15 rules and telling them it is alright to do so. This rule is there to make sure that players are not confused about the rules and to remove those players who encourage others to ruin the game with them. If you see anyone doing the above, report them by all means under the above rule. Q: A player said "Hehe, go and scam that noob, nah jk. ", do I consider it to be encouraging rule breaking? Q: A player floods the chat screen with messages like "I'm using an autotyper, it's great! Try it! ", should I report the player under rule 9 or rule 1? What is misuse of customer support? It involves reporting an innocent player, sending in useless queries to Jagex, lying to Jagex about certain information and abusing Jagex Staff. This rule is important so that Jagex can process the reports and queries as fast as possible, and ensure that players who really need assistance receives the support they need. If you see anyone doing the above, report them under this rule. Q: A player says that he is going to report a player who called him a noob. Should I report him for misuse of customer support? A: Not all players have read the knowledge base, so they would not know that the word "noob" is not reportable. Perhaps you can tell him that it is not reportable, and ask him to add the player to ignore. Q: A player is saying "Report (player name)!! He is a scammer! ", is that misuse of customer support? A: No, it is not. The player is just warning everyone about the "scammer", so no harm is done. However, you should not listen to him and proceed to report the "scammer". As you have no evidence that the "scammer" is really scamming, it would not be wise to report him. Perhaps you can ask the player to report the "scammer" himself, and proceed on. What is advertising websites? It includes advertising websites, and also advertising any other product (such as third party programs) in game. This rule is vital as it protects the account security of all the players, and make sure that no one is directed to a site with inappropriate content. For this rule, as long as a URL link is involved, you can report almost every instance that happens. Q: A player is mentioning a fan site and directing a player to it, what should I do? A: Unless a URL is mentioned, you should not report. Most official fansites are safe, so it is alright if players direct others to these help sites without mentioning a URL. However, if you are unsure about the safety of that fansite, you can proceed to report the player. Q: A player advertised his site on the official forums, what should I do? A: In such a case, it would be best to report the thread that was breaking the rules in the "Forum Emergencies" sticky located in General Forum. Remember to read the instructions there carefully before proceeding to report. What is real world item trading? It is the trading of items in Runescape for real world money. This rule is there to prevent players from trading accounts for the skills and items instead of earning them through game play. It is also unsafe, as many of these people may attempt to steal your money. You will seldom be able to see it in game, but if you do see anyone doing it in game, it would be best to send in a report under this rule. Q: I see a player selling an item on another site for real world money, what should I do? A user by the name of [insert username here] was advertising a site which violated rule 12. The site advertised was [insert site name here]. Q: A player said, "I bought an account from ebay a week ago." What do I do? A: You can report the player under "encouraging rule breaking". What is against the rule on personal details? It is to ask for or give out a person's personal information which can be used to track down the person in real life. This rule is vital in protecting each and every one's privacy and safety in real life. If anyone is seen doing that, you can report under this rule. Q: A player is asking for the age of another player, is that considered asking for personal details? A: Nope, age is not personal details, reason being that there are lots of people who have the same age as you. It is impossible to track down a person in real life just by knowing the age. Q: Is asking for a person's country considered asking personal details? A: Nope, it is not. Often when players chat, they will ask for each other's nationality. It is alright to do that, as it's impossible to track down a person in real life with the above information. What is misuse of official forums? It is to post something that is against the code of conduct of the forums. This rule is necessary to maintain a friendly environment on the forums, as well as safeguard the players who use the official forums. You will rarely come across any situations relating to this rule in game, but if you do come across it on the forums, report it in the "Forum Emergencies" thread located in the General Forum. What is advert blocking? It is when players attempt to block the advertisements on Runescape with advert-blocking software. This rule is essential for the free to play players to enjoy the free version of Runescape. There is hardly any instances relating to this rule in game, if a player admits to breaking this rule in game, you can then report them. Q: One of the advertisements is offensive, what should I do? A: If you find any advertisements inappropriate, report them by clicking on "Comment on our service" on main page. Fill in the information in the advert complaint form and send it to Jagex. Jagex will reply back to you as soon as possible. Note: Joking about any of the rules is equivalent to breaking them. Firstly, click on the "Report Abuse" button on the bottom-right of the game screen. Enter the name of the rule-breaker and then click on the "Next" button. Now select the respective rule broken. Your report will then be sent, and you should see a "Thank-you, your report abuse have been received" message.